World’s First Hubless Chopper Bike…Cool! 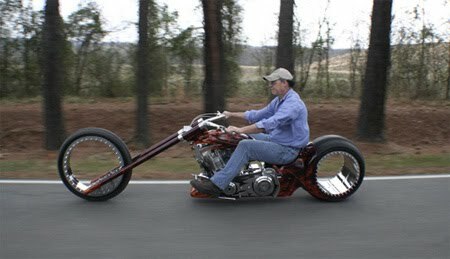 This hubless cool chopper bike by Amen Design is the world’s first fully functional motorbike with two hubless wheels. The biker boys at Amen Design have built a chopper based around Franco Sbarro’s hubless wheels. And it really rides! Hubless (centreless) wheel is a type of wheel with no center hub. Advantages of the hubless wheel includes includes decreased weight, lower center of gravity, increased braking leverage, and more accurate steering. We think it looks like a bike from the movie ‘Bolt’…pretty cool but changing the tyres would be a nightmare. Have you seen this cool alligator bike or ‘gatorbike’! A charity fundraiser decided to spread an entire alligator skin over a custom-built chopper motorbike and sell 1,000 raffle tickets at a snappy £75 each. 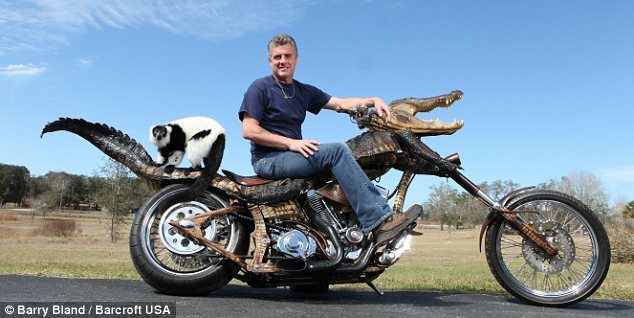 Jim Jablon, owner of the Wildlife Rehab centre in Hernando, Florida, devised the GatorBike to raise funds for the charity, which rescues neglected or abused exotic pets. The 120mph reptilian ride features the skin and skull of an alligator culled and donated by state officials. ‘I thought, “Why not put it to good use?”’ said the 45-year-old. Check out this cool custom green electric chopper, the first electric chopper in the world. Siemens announced that it has teamed up with renowned custom motorcycle manufacturer Orange County Choppers to build the first custom electric motorcycle. 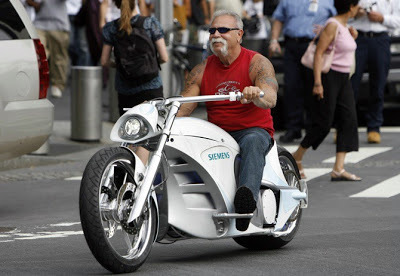 The “Siemens Smart Chopper,” which will be featured on the hit TV show American Chopper, was unveiled in an event at the Time Warner Center.